As a full time mum and mompreneur, I’m always on the lookout for recipes for healthy dishes that are not only quick and easy to make but also taste very good. 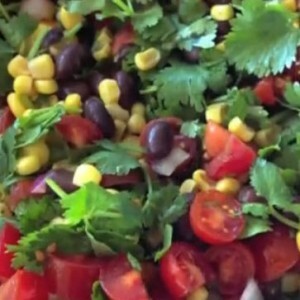 My friend Luci from LuciFit has recently shared a salsa recipe which just fits the bill. I have made this salsa several times and writing about it makes my mouth water. I have made it as a side dish to go with fish and as a salad as it is very tasty just on its own. I made big portions as Luci suggested that it tastes even better on the next day and I have used left overs to snack on when I felt a little hungry later in the evening. One of the ingredients is cilantro (coriander green), in case you don’t like coriander you can replace it with parsley. Also, in the recipe Luci suggests to use black beans, I have used kidney beans and I think it might be nice with chick peas too. I would love to hear your reviews of the salsa and if you have other suggestions for variations, please do share. Sign up for our online courses. My baby is asking for cookies! Do you reward your kids with sweets? How much is too much? Words – one of the most precious gifts you can give to your child! Do pre-schools need a sugar policy?